I need to see this movie, some people hate this scene and some people love it! 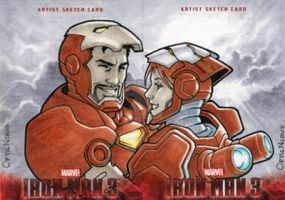 Pepper Potts: The Woman who Holds Tony Stark Together when the Armor Can't. Sums up the ending pretty well. HA where is your proud now stark. shitted down in your pants. Tony had some heroic moments but he spent much of the movie barely being able to function or in small town with malfunctioning armor. It's cool Pepper's has some heroic and awesome moments because apparently in the comics she gets her own suit. I think Marvel should do a movie about it; come on Marvel, I want a Pepper Pots movie! Yeah, she has a rescue suit in the comics, mostly used to rescue people instead of fighting villains. But she is awesome. I feel like Tony would do that... if he wasn't so shocked to see Pepper acting so epic like that. Haha! I love it!!! Pepper was one of the few things I liked about this movie. And Iron man, too be honest.